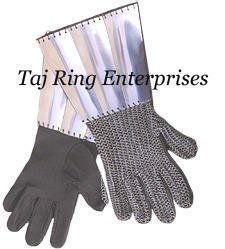 Prominent & Leading Manufacturer from Roorkee, we offer templar cross chain mail shirt, chain mail shirt with coif, medieval chain mail shirt, antique chain mail coif, armor chain mail coif and chain mail gloves. The shirt is about 34" wide, and has 3/4 length sleeves.This medieval Templar Chain mail shirt is made of 18 gauge steel. It has a Templar cross on the front. 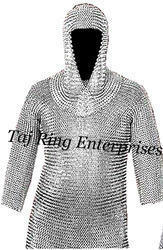 This Templar Chain mail shirt is full-sized and We are offering an exclusive range of superior quality Chain mail to our clients. This Chain mail is full-sized and wearable for costume purposes. This medieval Chain mail shirt is made of 18 gauge steel. 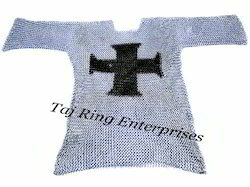 This Templar Chain mail shirt is full-sized and We are offering an exclusive range of superior quality Chain mail to our clients. This Chain mail is full-sized and wearable for costume purposes. 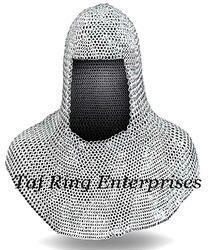 We are involved in offering a wide variety of best quality Chain mail Coif to our clients. 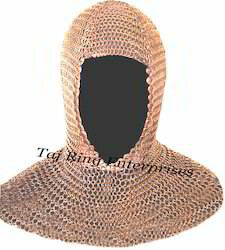 A Coif is a close fitting Cap made from Chain mail. That covers the top, back, and sides of the head including neck and shoulders. Its Collectible Chain Mail Coif. These high quality riveted Cain Mail are developed in adherence with international standards and norms which are widely appreciated by our clients. Its Collectible Chain Mail Coif.We are an eminent name of the market engaged in offering Rivated Chain Mail To the esteemed clients. These high quality riveted Cain Mail are developed in adherence with international standards and norms which are widely appreciated by our clients. Its Collectible Chain Mail GlovesWe are an eminent name of the market engaged in offering Rivated Chain Mail To the esteemed clients.